I followed the truck for a while wanting to ask the driver a few questions. I imagined the driver to be white, male, unaccountably stupid, slightly dangerous, completely ordinary. When your grandparents or great-grandparents or however far back it goes came from wherever they came from, where did they come from? How long was it before they learned English? Or, maybe you are Native American? Your ancestors’ tongue cut from their mouth? Eventually, the truck went up a driveway, behind some trees, and I chickened out. I followed the road I was on—we had turned off M-28 a while back—and I should’ve known. It went nowhere. And now in my mind leading nowhere I go back to that road and think how language is not only a way of speaking but a way of thinking; how we think in words we learn from our mothers, our fathers, our family, our teachers, our community, our culture; we think in the language we first learn; and I think how I wish I knew Yiddish, its sound, its meaning, its cadence not from a book or a course but from deep within, where heritage lies, where our souls lie; and the English of my Cornish ancestors. What was that like? Would I have understood their banter or yearned for subtitles? Why do people drive around with such stupid stuff on their vehicles? Back home, a bottle of champagne on the porch railing. Four swigs, maybe three maybe five, that’s all I could handle the night the Cubs won the World Series. I left the bottle on the railing, later noticing it was catching flies, flies my usual autumn nemesis, so there it sits, dead flies and ladybugs floating in flat champagne. An apt description, methinks, of November, 2016, so far. For many nights I couldn’t sleep, then poetry kicked in. Little mantras, short sequences of words, words with order, and, with trying to memorize, to jot down in the morning, words that brought back sleep. Hours and hours of sleep. In the morning I would look at the words and think, hmmm. The process is worthwhile, but the result? These poems? The words, they just shrugged: Who cares? The musical show “Damn Yankees.” In 1996 my father and I saw “Damn Yankees” at the Shubert Theater in Chicago. 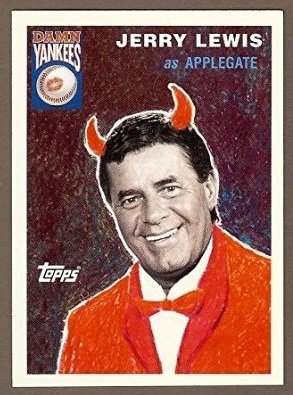 Jerry Lewis played Mr. Applegate. In the show a bargain is made with the devil and it has to do with a losing baseball team. I can never remember exactly what the bargain is or how it all turns out. But, as a musical comedy, no doubt all turns out well. Mostly, I remember the songs, such as Heart. But life is not a musical comedy, not yet, and increasingly throughout my life, as life progressed, moments and moments and more moments piling up, I have wondered: If the Chicago Cubs won the World Series, would that be the end of the world? The end of the world as we know it. Perhaps. Perhaps. Perhaps. Then the other night making dinner watching a deer nibbling grass at the edge of the lawn. A deer on the smaller side once in a while looking in at me while I gaze out at her. I must be nonchalant lest Josie catch on for right now I do want him chasing deer and if he thinks there are deer out there he will go nuts. I’ll have to let him out, he’ll chase the deer, and deer hunters are about, very near, as near as neighboring fields. So very casually I watch this deer as she pulls food from deep in the grass and looks up, tufts of green sprouting from the side of her mouth. There is another deer out in the field. She is larger. She is reaching up, pulling her food down from the tops of dried goldenrod—maybe? Or maybe it is something else she eats. She is out there a ways and it is all brown and but for the curve of her neck and the sway of vegetation I might not see her. As I am standing at the counter, Josie is simply more interested in his next bit of food. Will it be a spoonful of chick peas or a piece of rotini? He likes raw rotini. Lately these two deer have been about, and I appreciate their presence. I think maybe they are too small for anyone to shoot, but then again, I do not know, and certainly I do not know what anyone will do. Someone might shoot one or the other of these deer, maybe today or tomorrow or next Tuesday, or maybe one or the other of these deer will cross the road at a fatal time, or maybe a hundred other things. So I take my time, watch slowly. Josie waits.